Is the Nokia Lumia 900 the latest must-have Windows Phone? All signs point to yes. 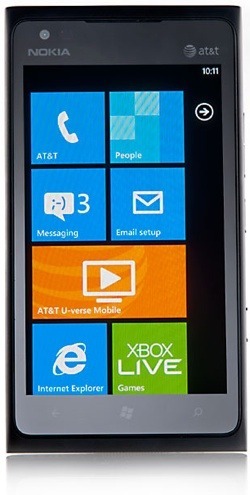 Positioned as a flagship Windows Phone, the Lumia 900 has been making a big impression among many early reviewers. And with its 4.3″ display, snappy 1.4GHz processor, 8MP camera, and beautiful form factor, these positive reviews seem to be well-earned. The Lumia 900 is, by all means, a solid phone at a great price. Despite the positive reviews, however, the Lumia 900 is lacking in one big area. Many business users want to know how to sync the Nokia Lumia 900 with Outlook. It will support Exchange sync out of the box, but standalone Outlook users must look elsewhere. CompanionLink offers two methods to sync Outlook contacts, calendar and tasks with the Lumia 900 – via Google or via Window Live. CompanionLink works by syncing Outlook data to a Google account or Windows Live account. From there the Lumia can be configured to automatically sync with either account over its wireless data connection. For more information on how CompanionLink syncs Windows Phone devices like the Lumia 900, visit www.companionlink.com/windowsphone/. This entry was posted in New Devices, Support Updates and tagged lumia 900, mobile productivity, nokia, windows phone by David. Bookmark the permalink. whatever happened to active sync?? It will not support Exchange “out of the box” if you are not using an approved certificate. Then, it simply does not give the user the option to accept the certificate, but shuts down. STUPID, STUPID, STUPID. Next attempt: the web UI Outlook. Here, you get a chance to accept the certificate and the phone simply hangs. Couple this with the willful bad viewing of anything Google and no Swype puts me back into an Android phone before the end of one month. Too bad as the phone OS nav and voice is excellent and the phone quality of construction is very good. Wow, good to know. So all WP7 users will need to make sure their Exchange certificate is approved. No. Incorrect. Maybe this time the comment is accepted. Many small Exchange users do not pay for the certificate. Therefore, Outlook on the phone simply craps out. What you need to do is MANUALLY import the certs. Personally, I went to the Exchange server webmail and then exported the certificate. Then, I sent a gmail to myself and loaded it on the phone. Rebooted and it FINALLY worked. So, yet again Microsoft has accomplished making what should be SIMPLY DONE and EASY difficult, cumbersome and moronic.